A full week of geekness at the conference finally winded down today. This was my first TechEd and I thought it was great. Apparently this was much smaller than the past TechEd's and also not as good but for me, the sessions I went to were great. One highlight for me was meeting Kevin Lam, founder and CEO of Impacta Labs, after his talk about application security. Great talk, awesome examples, really nice guy. Microsoft kept us well fed. Not only was there breakfast and lunch, there were snacks in the afternoon as well. It differed daily from chocolates to chips to popcorn and cracker jacks. 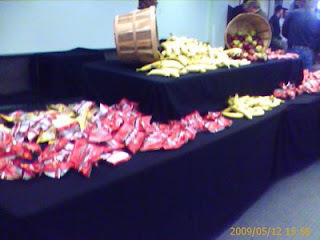 There were warm cookies and fruits too! So what's snack time without something to drink? 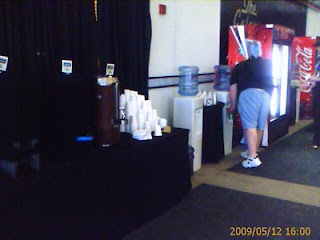 The conference had easily accessible water stands, starbucks coffee, soda refrigerators all over the place. The soda refrigerators were fully stocked with Coke products as well as fruit juices. I had my fair share of orange juice and coffee. What's a geek conference without wireless? 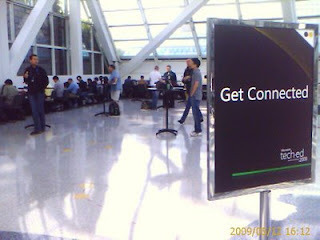 Wireless hotspots were situated all over the place as well as computer stations. Other cool things at the conference were Microsoft Surface machines situated at the break areas. These things reminded me of the old school pacman machines! Remember those? 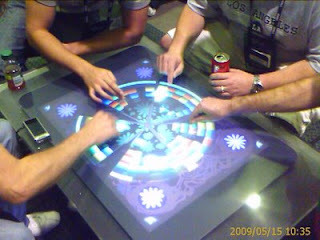 Responsiveness to your touch was a little slow but the multi touch capability was awesome. This tile game grabbed a lot of attention. Basically, you line up 3 tiles of the same color together and fires that color bomb to the other users "pie". It's basically an undending game and allowed 6 players. 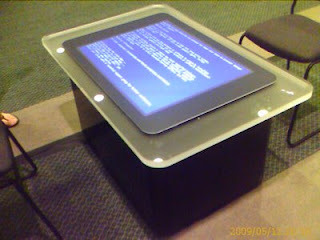 That's the blue screen of death, by the way. All in all, I thought the conference was good, I enjoyed most of the sessions I took and I learned plenty of new Microsoft technologies. Once I find my camera, I'll post the stuff I got from partner expo.